After a spell in the army he returned to Nystrom’s and started driving cars. He saw the first SAAB 92 prototypes testing on the dirt roads around Trollhattan and began to take an interest in the cars as they were built in his home town. It’s quite ironic that his first big car event was to be in a Volvo, as navigator in the 1953 Swedish Rally. 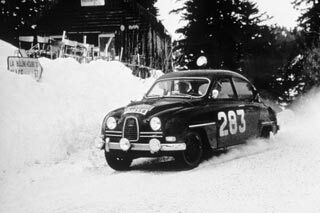 Eventually he bought a second hand SAAB 92, became regional champion in 1954, and with success came some help from the factory in the form of spares and repairs. After he started winning rallies more help came his way and an old works car was lent to him after his own car broke its steering whilst leading the Swedish Rally. With more assistance from the factory more and more success came his way. He finished second in the 1959 European Rally Championship. He entered his first Monte Carlo Rally in 1960 and his first win came in 1962. He won again the following year but will always be remembered for his three consecutive RAC rally wins in 1960,1961 and 1962. He retired from competitive driving after the Baja 1000 in 1970 and I think its fair to say that he was probably the first Superstar rally driver occupying the position that is nowadays afforded to people like Petter Solberg and Sebastian Loeb. After retiring from competitions Erik worked in the PR department of SAAB and was involved with many SAAB projects including the Talladega SAAB 9000 Long Run in 1986. A long lasting Public Relations exercise which has featured Erik is the “SAAB Safer Winter Driving” that started with American journalists test-driving on Swedish winter roads. It was so successful that journalists from other countries became involved. Erik was also heavily involved with SAAB Clubs throughout the world, attending events, judging classic car shows, presenting prizes etc. He, together with his late wife Pat (who was the sister of Sir Stirling Moss), has been President/Patron of The SAAB Owners Club of G.B. Ltd since 1965 and has attended most of the Club’s important anniversaries through the years. He could have been seen at most of the International SAAB Club meetings. “Mr SAAB” was a friendly, approachable person and his “Erik, call me Erik” put you immediately at ease. Picture:- Monte Carlo Rally 1963. Erik Carlsson´s 2nd straight win.